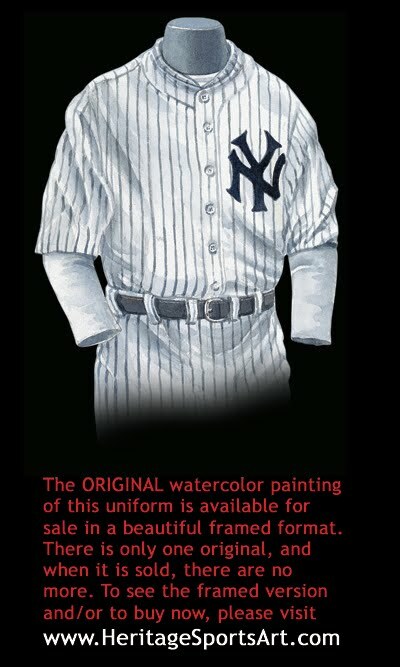 Please click on the evolution of the Yankees uniform poster above for a close-up version of the poster. The descriptions below give you some insight and background about the uniforms and/or eras depicted in the poster. The American league was founded in 1901, and I’m sure to the surprise of some modern day fans, there was no team in New York. The eight charter members of the American League were: Chicago (started out as the White Stockings, became the White Sox); Boston (started as the Americans, became the Red Sox); Detroit (started as Tigers and remained the Tigers); Philadelphia (started as the A’s); Baltimore (started as the Orioles, became the Yankees); Washington (started as the Senators, became the Twins); Cleveland (started as the Blues, became the Indians); Milwaukee (started as the Brewers, became the Browns and then the Orioles). Turn the hands of time ahead 100 years, and four of the eight teams are exactly where they started – Chicago, Boston, Detroit, Cleveland. Of the other four, the A’s moved to Kansas City and then on to Oakland; the Senators moved to Minnesota and became the Twins; Milwaukee moved to St. Louis in 1902 and became the Browns, then moved to Baltimore in the 50’s and became the Orioles); and then there were the Baltimore Orioles, whose 1901 jersey we show here. The 1901 Orioles, whose manager was the great John McGraw, finished the season with a 68-65 record, but took a step backwards the following season. After starting out 26-31, John McGraw was let go, and Wilbert Robinson (later the manager of the Brooklyn NL team) took over, but his record was a dismal 24-57, leaving the team with a 50-88 record and sole possession of last place. As we see on this black Orioles road uniform, the orange “O” is for Orioles. This is a very formal collar style, traditional for this period of time. 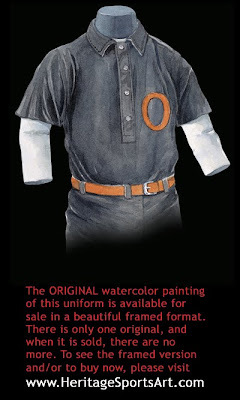 Note also that even though the jersey has four buttons down the front, this is a “pullover” style jersey that had to be pulled over the head – once again, this was common in jerseys throughout baseball at this time. We believe the first major league team to wear a completely buttoned front jersey (ie one that didn’t have to be pulled over the head) was the 1909 Phillies, followed by the 1911 Cubs. The pullover style jersey finally disappeared after the 1939 season (the A’s were the last team to wear it), but of course pullovers resurfaced in a big way with the double knit era of the 70’s and 80’s. Finally, notice that there is a center belt loop, which was to secure the belt buckle off to one side. Players of this era usually wore the belt buckle to one side so they could prevent injury when sliding into a base. Partly because of their record, and partly because of their ballpark, the 1901 and 1902 Baltimore Orioles had a tough time drawing crowds to their games, and at the end of the 1902 season they packed up their bags for what many now consider to be the capital of baseball - New York City – the most obvious choice for a franchise in the fledgling American League. The New Yorkers played their games at Hilltop Park in New York, and thus were known as the “Highlanders”. The Highlanders, who would later become known as the Yankees, played their first game in New York on April 29, 1903. They would finish their first season in New York with a respectable 72-62 record, good for 4th place in the 8 team American League. Here’s the history of the “Yankees” name, according to a great website devoted to Yankees history http://ultimateyankees.com/. In 1904, the season depicted here, the Highlanders finished a fantastic 92-59, 1½ games behind Boston. Interestingly, the Red Sox also lost 59 games, but they won 95. I’m not sure why New York wasn’t allowed to play 3 more games to see if they could tie things up – if someone out there can fill us in, I’d appreciate it! Email us at ssillcox@rogers.com and let us know why! We do know that the 1904 Yankees were managed by pitcher Clark Griffith, who would go on to become the manager, and owner, of the Washington Senators. The hitting leader on the ’04 Yankees was “Wee Willie” Keeler, a 5’ 4 ½” 140 lb future hall of famer who hit .343. On the mound, Jack Chesbro went – are you ready for this – 41-12 with a 1.82 ERA. He started 51 games and went the distance in 48 of them – pitching a whopping 454 2/3rds innings in the process! This 1904 dark blue uniform with white belt is a road uniform. You can see that the collar has been slightly modified from 1901 in that the lapels are now slightly rounded at the ends. This is still a pullover style jersey with a center belt loop on the pants. As mentioned above, by 1910 the team was known as both the Highlanders and the Yankees (the Yankees wouldn’t become official until 1913). On the field, the team had yet to win a pennant, and 1910 would prove to be no exception. The Yankees did finish with an impressive 88-63 record, which was good for second place in the AL, but a whopping 14½ games behind Connie Mack’s Philadelphia A’s. Note how on this home white uniform the old style “lapel” collar has been replaced with a blue, stand up “cadet” style collar. This type of “cadet” collar, a small upright collar, was a fashion worn by many teams beginning about 1910 and lasting through the mid-late 20’s. 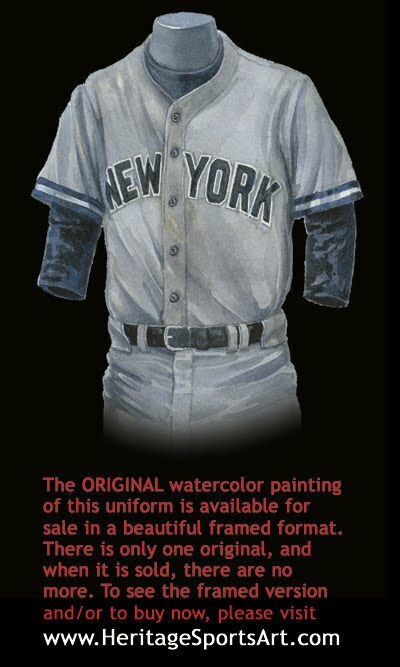 If you look very closely, you’ll see a red “NY” on the collar of this home uniform, and even more importantly, you’ll see the now familiar interlocking blue “NY” on the left sleeve. Here’s the history of this interlocking “NY” logo, according to a great website devoted to Yankees history http://ultimateyankees.com/. By 1912 the Highlanders/Yankees were playing their last season at Hilltop Park. As noted above, by this time the “Yankees” nickname was catching on, and when the team moved to the Polo Grounds in 1913, the name “Yankees” was made official. You’ll notice that this Yankees uniform features, for the first time, pinstripes, and in fact the Yankees are frequently credited with the birth of the pinstripe uniform. In actuality the Boston Red Sox first sported pinstripes for their road uniforms in 1907, five years before the Yankees. 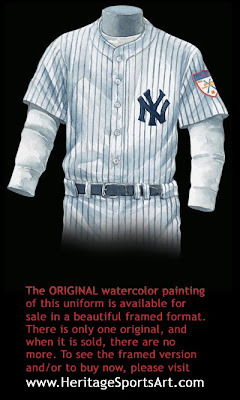 These Yankee pinstripes haven’t deviated much over time, however. 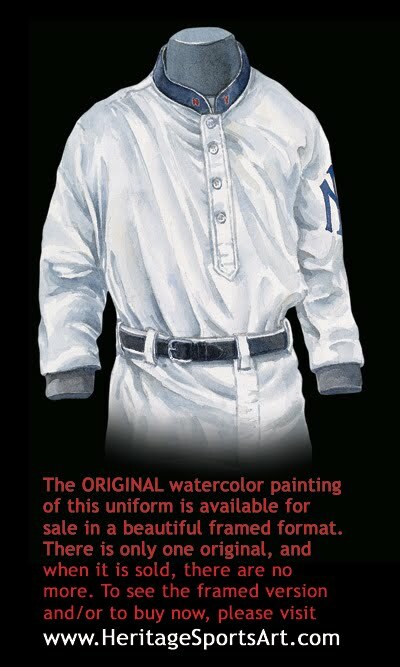 This 1912 home uniform is almost identical to the ones worn by today’s Yankees. Over the years the Yankees and the Tigers are two teams that seem to have “stayed with what works”. 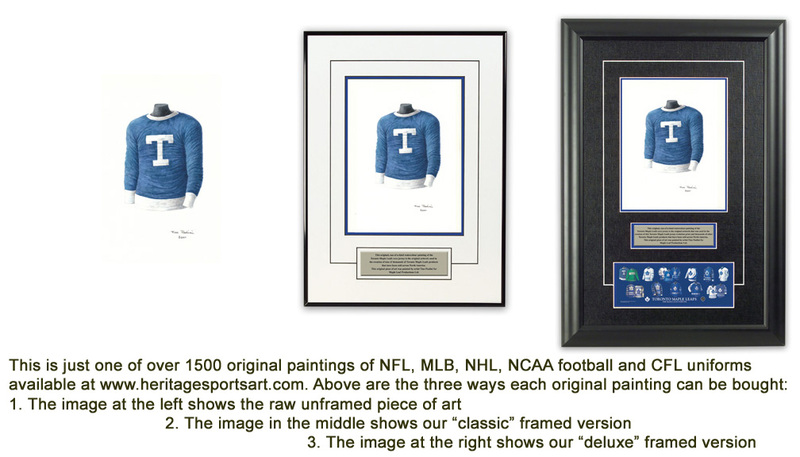 Consequently both teams’ uniforms have resisted change and stood the test of time quite well. Long live tradition! Here’s some more history of the famous Yankee pinstripes, according to a great website devoted to Yankees history http://ultimateyankees.com/. On the field, the 1912 Yankees were rather forgettable. They finished last with a 50-102 mark, some 55 games behind the league leading Red Sox. As a side note, the Red Sox went on to win the 1912 World Series, their second World Series championship (their 1st was in 1903). They would also win it all in 1915, 1916 and 1918, and would thus have 5 wins under their belt by 1918. The Yankees wouldn’t win their first until 1923. Since then? Yankees 26 – Red Sox 0 (or will it be 27 as of the end of the 2001 season?). From 1927 to 1930 the Yankees wore their nickname on the front of their road gray uniforms. 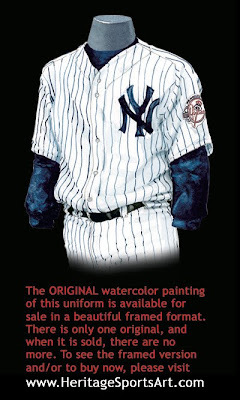 This was the only time in the history of the Yankees where the name “Yankees” was spelled out on the jersey. This was also unusual for a baseball team to wear their nickname on their road jersey – typically it has been the case, and still is to this day, that teams wear their city name on their road jerseys and their nicknames on their home jerseys. The 1927 Yankees, perhaps the greatest Yankees team ever assembled, amassed an incredible 110 - 44 record, and went on to face the 94-60 Pittsburgh Pirates. The result? A 4-0 sweep by the Yankees. The Yankees were led by Babe Ruth, who hit .356 and clobbered a staggering 60 home runs (a record that would not be broken until Roger Maris’ 61 in ‘61). As incredible as Ruth was, the Yankees also had Lou Gehrig, who hit .373 with 47 homers of his own and was named AL MVP ahead of Ruth. And on the mound, the Yankees starters were Waite Hoyt, who went 22-7; Wilcy Moore, 19-7; Herb Pennock, 19-8; and Urben Shocker, 18-6. The Yankees are in the midst of an incredible 4 straight World Series Championships (1936-1939), and after going 99-53 in the regular season, the 1938 Yankees defeat the Chicago Cubs 4 games to 0. This marks the Yankees’ 7th World Championship in 16 years (1923, 1927, 1928, 1932, 1936, 1937), and there are more to come. A lot more. Some of the players for most/all of this incredible four year stretch were: Joe DiMaggio; Lou Gehrig; Tony Lazzeri, Frankie Crosetti, George Selkirk and pitchers Lefty Gomes, Red Ruffing, Bump Hadley, Johnny Murphy and Monte Pearson. 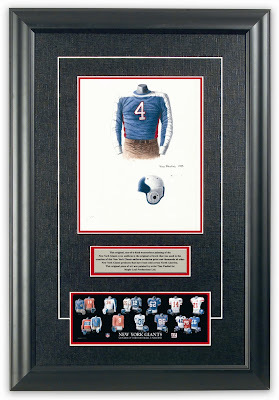 You’ll notice an unusual logo on the left sleeve of this 1938 home jersey – this is the 1939 New York Worlds Fair logo. 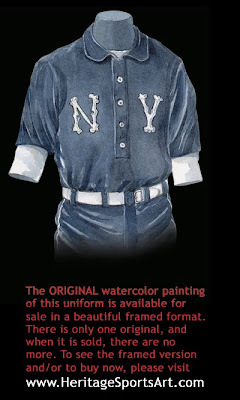 Even though the NY Worlds Fair was held in 1939, the Yankees uniform helped promote the fair a year ahead of time, and they would have worn it again in 1939 except all Major League teams were required to wear the 100th Anniversary of baseball patch in 1939. Back to the Fair for a minute - if you are a student of history, you may be aware that the 1939 New York Worlds Fair was perhaps the most successful Worlds Fair ever held – it was hugely attended and showcased an endless stream of exhibits and delights that has really never been equaled by a Worlds Fair before or since. December 1941 to November 1945 America goes to war. 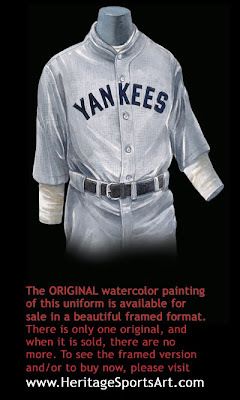 We have depicted the Health patch on this 1943 road uniform when in actuality the Health Patch was only worn for the 1942 season – we should have labeled this a 1942 jersey, not a 1943 jersey. This will be corrected in future editions of this poster. If this was truly a 1943 jersey, it would have featured a Stars and Stripes patch. During the 40’s, 50’s and 60’s many teams used zippered jerseys instead of the more traditional button front jerseys, while a handful of teams wore them well into the 70’s and even the 80’s. 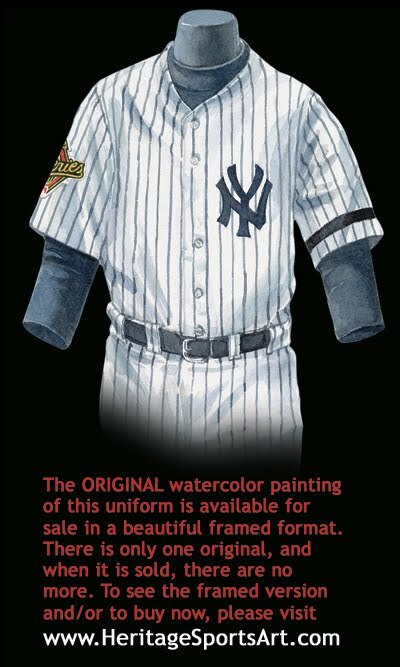 The Yankees were one of three pre-1977 major league teams that never wore zippers, the others being the Reds and A’s. The 1937 Cubs were the first team to wear a zippered jersey, and as far as we can tell the 1988 Phillies were the last to wear one. The 1943 Yankees complete another great season in 1943, going 98-56 and finishing 13 ½ games ahead of the 2nd place Washington Senators. In the World Series, the Yanks square off against the 105-49 Cardinals, and make short work of them, winning the World Series 4 games to 1 in what was really a pitchers’ series – the Yankees batted .220 vs the Cards’ .224. This is the rookie year of the fresh-faced Mickey Mantle, although I’m not sure that you could tell what heights he would go on to achieve based on his rookie year stats – he hit .267 in 96 games, striking out 74 times while hitting 13 home runs. And in the World Series he would see action in 2 games, getting a single in 5 at bats. But Mantle would see his team win their 3rd straight World Series Championship – it would end up being their 3rd in a string of 5 consecutive wins – with a 4-2 World Series win over the surprising New York Giants. The Yankees’ 5 World Series championships in a row - from 1949-1953 - is a record, and surpassed their own mark of 4 Worlds Series in a row from 1936-1939. Consider the record: The Yankees finished 1949 with a 97-57, record; 1950 with a 98-56 mark; 1951 with another 98-56 mark; 1952 with a 99-52 record; and 1953 with another 99-52 record. A remarkably consistent and outstanding record in what many consider to be baseball’s finest era, an era dominated by the Yankees. The Yankees of the late 40’s and early 50’s were led by Joe DiMaggio, Phil Rizutto, Yogi Berra, Hank Bauer, Johnny Mize, Billy Martin, Jerry Coleman, Tommy Henrich, Vic Raschi, Allie Reynolds, Whitey Ford, Ed Lopat – it reads like a who’s who of baseball. The patch on this pinstriped home uniform commemorates the 50th anniversary of the American League, which was founded in 1901, 25 years after the National League. This is why the American League is considered by some as “the junior circuit”. A uniform note: Uniform numbers first made their appearance on the front of a uniform in 1952 - the Brooklyn Dodgers were the first team to wear uniform numbers on the front of their jersey. The Braves followed suit in 1953, and the Reds joined in beginning in 1956. The 1916 Cleveland Indians actually wore a uniform number on their sleeve, but it wasn’t until the ’52 Dodgers that the number made it to the front. 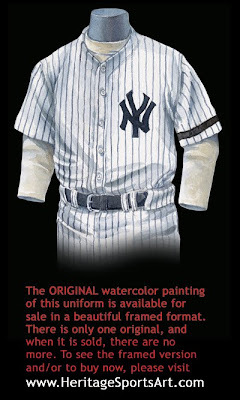 But the Yankees have never worn a uniform number on the front of any of their jerseys. But let’s go back to 1961, when the Yankees were on top of the world. There were many greats on the ’61 Yankees – Bobby Richardson, Tony Kubek, Elston Howard, Chet Boyer, Yogi Berra, World Series MVP Whitey Ford, Ralph Terry – but two names stand out from the rest, largely because of the power of their bats, Mickey Mantle and Roger Maris. Mantle had a monster season in 1961, hitting .317 with 128 RBI and 54 dingers, but Maris did him several better, hitting .269 with 142 RBI and 61 home runs, thus breaking one of the oldest and most cherished records in all of baseball – Babe Ruth’s mark of 60 home runs in a season. Maris would win his second consecutive regular season AL MVP in 1961 (Mantel would turn the trick in 1956, 1957 and 1962). 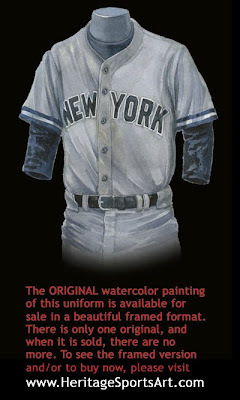 The home uniform depicted in this 1961 painting is virtually unchanged from 1951 and 1938, and even from the 1912 jersey! It’s a white jersey, with fine black-blue pinstripes and a very dark blue interlocking NY logo on the left breast. The Yankees make it back to the post season in 1976 after being away since ’64 – an eternity in Yankee years, a short snooze to the rest of the world. They’ll fall to the ’76 Cincinnati Reds in 4 straight, but then came 1977 and 1978. 1977 and 1978 are almost carbon copies of each other, and as such you’ll often hear baseball fans (and Yankees fans) saying both years in the same breathe – as in the “77-78” Yankees. The ’77 Yanks finish 100-62, the ’78 Yanks 100-63. In both years they beat the Kansas City Royals to win the American League Pennant – 3-2 in ’77 and 3-1 in ’78. In both years they faced the L.A. Dodgers for the crown, and come out winners in each – 4 games to 2 in ’77 (including Reggie Jackson’s three consecutive homers, each on the 1st pitch, in the 6th and deciding game of the ’77 series), and 4 games to 2 in ’78. But the difference, and if you’re a 30+ year old Yankee fan you will remember where you were on October 2nd, 1978, was that the ’78 Yankees had to face the Boston Red Sox in a one game playoff at Fenway to determine the winner of the AL East. The Yankees were down 2-0 when the seventh began but had rallied. Chris Chambliss and Roy White reached safely on singles and Bucky Dent, a .243 hitter with four home runs during the season, came to the plate with two out. Dent lofted a 1-1 pitch from Mike Torrez, the Boston starter, over the Green Monster -- the 37-foot wall in left field -- to give the Yankees a 3-2 lead. Dent's shocking blast was the biggest blow in a 5-4 win over Boston and put the Yankees into postseason play for the 3rd straight year. 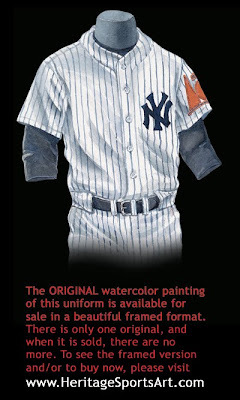 The 1978 road uniform is a little bit different than the last one we saw, in 1943, in that it features a white outline around the dark blue “Yankee” lettering, and there are now two dark blue stripes on the sleeve cuffs. This road jersey is of a double-knit style that most major league teams succumbed to during the 70’s and early 80’s. But unlike most other teams, the Yankees jersey is not a pullover style jersey, although it is made of stretchy, synthetic material. 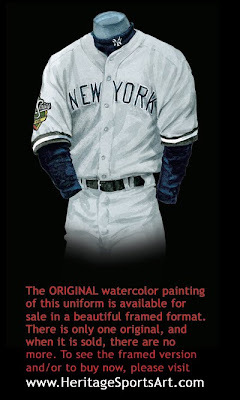 Most teams wore pants that were called “Sans-a-Belt”’s because the elasticized waistline eliminated the need for a belt, but once again, the Yankees never surrendered to this trend. The 1970 Pirates were the first double-knit - sans-a-belt team, and the Cards and Astros joined them in 1971. By 1975 two thirds of major league teams had succumbed but never the Yankees (even though they did were jerseys made from double knit fabric). Dave Winfield played 8 great seasons with the San Diego Padres, but when he became a free agent, the lure of the Yankees, (and a huge contract!) was too much and he began his tenure as a Bronx Bomber this season. In 105 games he batted .294, with 13 homers and 68 RBI. But there were so many other names as well – Goose Gossage, Ron Guidry, Tommy John, Rick Cerone, Willie Randolph, Lou Pinella, Reggie Jackson, Graig Nettles, Dave Righetti – and more. But 1981 is perhaps known best for what happened off the field – a players’ strike – that resulted in the odd situation where the winner of the 1st half of the season in each division played the second half winner (remarkably all first half winners were different than the 2nd half winners) for the right to advance to the League Championship Series. Thus the Yankees, winners of the 1st half with their 34-22 record, went on to play the Milwaukee Brewers, the 2nd half winners (the Yankees finished the 2nd half 25-26, 6th out of 7 teams). The Yankees prevail in the playoff 3 games to 2, then sweep the Oakland A’s 3-0 in the ALCS. This puts them in the World Series vs the Dodgers for the 3rd time in 5 years (1977 & 1978). But this time the Dodgers take their revenge on the Yankees, winning the last 4 straight to take the Series in 6 games. The Yankees, more than any other team in professional baseball, honor the players and management that have been influential in the development of the team and thus from time to time wear a black armband in respect for the death of a colleague. 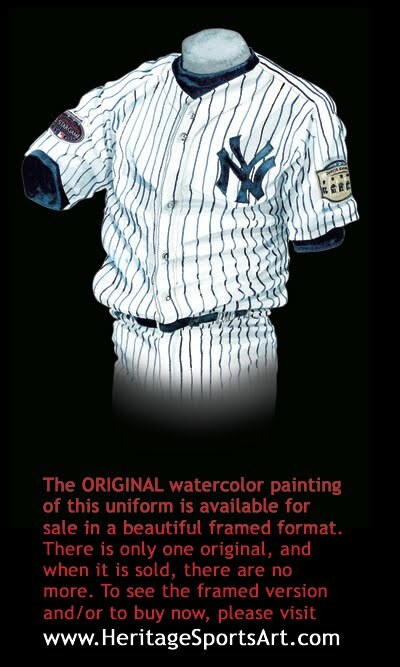 Thus over the last 25 years the Yankees have worn numerous black bands, in most cases for an entire season. In 1981, the Yankees wore an armband honoring Elston Howard who played for the Yanks from 1955-67 and died in December 1980. For a great site on the history of Yankees armbands, please visit this site. I would very much like to thank blog reader Kurt Flechtner of Norfolk VA for letting us know who the armband honoured and referring us to the armband site. The Yankees start an amazing run this year, winning the next four out of five World Series championships, ’96, ‘98, ‘99, and 2000! The 1996-2001 Yankees have to be mentioned in the same breath and with the same reverence as the 1936-39 Yankees (who won 4 World Series in a row) and the 1949-53 Yankees (who won 5 World Series in arrow). Looking back, the Yankees finished 92-70 in ‘96; 96-66 in 97 (2 games back of the Orioles); a whopping 114-48 in 1998; 98-64 in 1999; 87-74 in 2000; and 95-65 in 2001. It has been a remarkable team, surprisingly void of huge egos and controversy – in many ways these Yankees have reflected the nature of their manager, Joe Torre. In 1996, the first year in this tremendous string, the Yankees met the Texas Rangers in the first round of the playoffs (baseball added this extra round of playoffs beginning in 1995), and knocked them off 3 games to 1. Next up were the surprising scrappy Baltimore Orioles, but led by MVP Bernie Williams, the Yankees knocked the O’s off 4 games to 1. In the World Series, the Yankees squared off against the defending champion Atlanta Braves. The Braves hammer the Yankees 12-1 and 4-0 in New York, and can’t help but feel good about heading back to Atlanta for games 3, 4 and 5. So what happens? The Yankees peel off 4 straight victories (5-2; 2-0; 1-0; 3-2) for their 1st World Series victory since 1978. This 1996 home uniform pays tribute to Yankee great Mickey Mantle, who passed away in August 1995, with a black armband on the left sleeve. 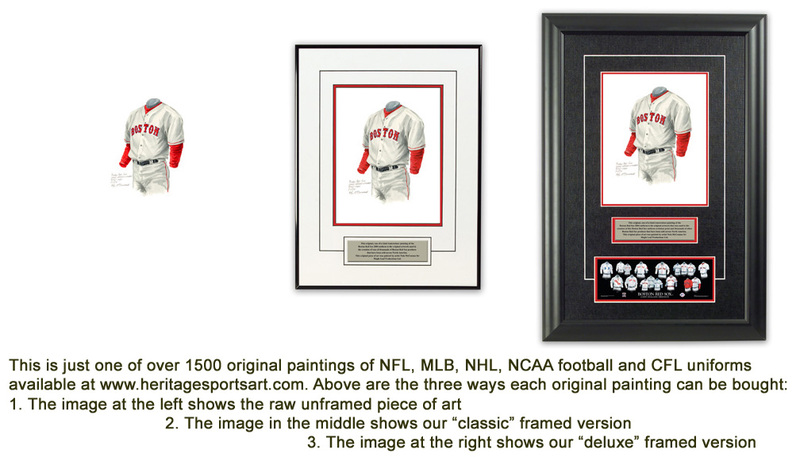 The patch that we see on the right sleeve is a “World Series patch”, this is something that baseball started in the late 80’s – the practice of wearing a “World Series” patch in the World Series. The patch changes from year to year, but usually contains the year and the words “World Series”. After missing the playoffs by 2 games in 1997, the Yankees were back at it in 1998. And then some! Featuring great team play and not celebrating the individual, the 1998 Yankees won an amazing 114 games in the regular season, the third highest season win total in Major League history. The Yankees went 114-48 in ’98 for a remarkable .703 winning percentage. The all time record belongs to the 1906 Chicago Cubs who won 116 in a season and went 116-36 for an amazing .763 winning percentage. In 2001 the Seattle Mariners went 116-46 to better the Yankees’ 1998 record, but the Yanks had the last laugh as they knocked the Mariners off in the playoffs. After beating the Texas Rangers 3-0 in the first round of the playoffs, the ’98 Yankees then subdued the Indians 4 games to 2 on the strength of MVP David Wells’ arm, and found themselves up against the San Diego Padres. Once again, there was no doubt about it – I’m not sure the Padres knew what hit them. Baseball’s most dominant team in the regular season is baseball’s most dominant team in the post season. Final score? Yankees 4 – Padres 0. World Series #2 in the last 3 years. And it wouldn’t stop there. In 1999 the Yankees do it again, beating the Braves in 4 straight yet again. Then in 2000 the Yankees do it to their cross-town rival Mets in the first “subway” series since Oakland played the Giants in 1989 (although some don’t call that a subway series) by a 4-1 margin. As for the uniform, it’s basically the same look as the 1978 uniform, a tribute to the consistency of Yankees uniforms. A couple small notes: in 1998 we see a different “World Series patch” on the right sleeve than we did in 1996 , this is because baseball uses a different patch each year on the World Series teams’ uniforms. As noted earlier, the patch changes from year to year, but usually contains the year and the words “World Series” and this year is no exception. We also see a high collared t-shirt/undershirt with an embroidered white “NY” on the collar. The practice of wearing embroidered undershirts began at some point in the 90’s, to the point now that many teams basically consider the t-shirt part of the uniform. The New York Yankees were the most successful baseball franchise of the 20th century (25 World Series Championships in 100 tries) and at the start of the 21st century they looked to continue that trend with win #26. After winning 98 games and claiming the AL East crown by 4 games in 1999, the 2000 Bronx Bombers struggled down the stretch losing 6 straight to the Devil Rays, and Orioles. They managed to hold on to the division lead and win the AL East by 2 games over the Boston Red Sox with an 87-74 record. The Yanks met the AL West winners, Oakland A’s, in the divisional round of the playoffs. They got off to a slow start losing game one in Oakland 5-3. The Yanks would regroup and win the best-of-five series in five games, despite the fact that their ace, Roger Clemens lost games 1 and 4. In the next round they faced the Seattle Mariners for the for the American League Championship. Once again they started slowly losing to the Mariners 2-0. But once again they would rebound winning games 2, 3, 4 and 6 to clinch the series and their 37th American League pennant. The Yankees were joined in the World Series by their cross-town rival Mets in what would be the first Subway Series in 44 years. The last Subway Series took place in 1956 when the Yanks played the Brooklyn Dodgers. The Bronx Bombers won that series in seven games. In the 2000 World Series the Yankees would not be haunted by a slow start, taking Game One. They would win again in Game Two, extending their World Series winning streak to a record 14 games. The Yankees’ World Series roll would come to an end at Shea Stadium in Game 3 where the Mets won 4-2. The Yanks would bounce back immediately in Game 4 as Derek Jeter led things off with a homerun. The Yankees’ bullpen held off the feisty Mets for a 3-2 win and a 3-1 series lead. The Yankees would then go on to win their 26th World Championship after Luis Sojo's single up the middle scored 2 runs in the top of the 9th of Game 5 to secure a victory. This series will be best remembered as the series when Roger Clemens threw a piece of Mike Piazza’s broken bat back at him, after it was shattered by Clemens’ pitch. The Rocket, caught up in the excitement of the game, claimed he thought he was throwing a ball. The Yankees were on the road at Shea Stadium when they won their 26th World Series championship. And despite being in their hometown they were nattily attired in their traditional road grey uniforms, like the one seen on our poster representing the year 2000. Tradition is a word that is often used when describing the NY Yankees. The tradition of simplicity with the road uniform continues here with the only real distinguishing mark on the outfit are the words “NEW YORK” spelled out in dark, dark blue block letters across the front of the jersey. One other note about this uniform: If you look closely on the right shoulder you’ll see a World Series patch. It is our belief that the custom of both teams wearing a year-specific World Series patch began in 1987 and has continued ever since. 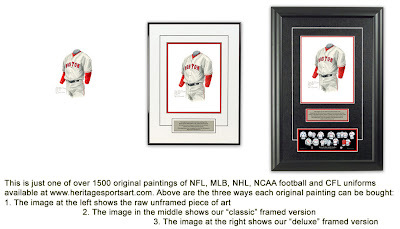 As noted earlier, MLB uses a different patch each year on the World Series participants’ uniforms. The patch design changes from year to year, but it always features the World Series year and the words “World Series”. Start spreading the news; the New York Yankees are 100 years old! In 2003, baseball’s most recognizable team celebrated its 100th anniversary in New York (the franchise actually began in 1901 as the Baltimore Orioles, but transferred to New York in 1903 where for their first 10 years they were known as the Highlanders). The team, despite not having won a World Series since 2000, was still the class of the American League winning 101 games giving them the best record in the Junior Loop. Manager Joe Torre, who was now in his 8th season with the Pinstripers, provided the team with strong leadership from the dugout. On field, up the middle of the diamond, veterans C Jorge Posada, SS Derek Jeter and CF Bernie Williams anchored the team defensively. The Yanks also expanded their global appeal in 2003 by signing Japanese superstar Hideki Matsui. In his first season in the Major Leagues Matsui lived up to his hype by hitting .287 with 16 home runs and 106 RBI. On the mound Roger Clemens cemented his place among the greatest pitchers of all-time by collecting his 4,000th career strike out and 300th win. The Yanks would go on to win their 6th straight AL East title. In the postseason the Yanks played the Minnesota Twins in the ALDS and sent them home in four games, winning the series 3 games to 1. In the ALCS it would be high drama as the Yanks met up with long-time rivals Boston. The Yanks and Bosox would trade victories leaving the series tied 3-3 after six games. Game seven, played at Yankee Stadium, would go into extra innings after Pedro Martinez squandered an 8th inning lead. In the 11th inning NY 3B Aaron Boone crushed the first pitch he saw off Red Sox knuckleballer Tim Wakefield. The Yanks were off to the World Series after claiming their 39th American League pennant. The World Series would be a letdown for Yankee fans as they lost to the Florida Marlins 4 games to 2. On paper the Yanks were pegged to win their 27th World Series championship, but the Marlins were making a habit of proving people wrong all postseason and the World Series would be no different. The Yanks lost game 1 in the Bronx 3-2. They bounced back with a convincing 6-1 win in game 2. After the Series shifted to Miami the Yankees won Game 3, 6-1 again, behind a solid pitching effort from Mike Mussina and Mariano Rivera. Roger Clemens pitched Game 4 and gave up 3 runs in the 1st. They would be the only runs he would give up until he was lifted from the game in the 8th. His teammates picked him up by tying the game with 2 runs in the 9th. The Marlins SS Alex Gonzales would hit a game-winning homerun in the 12th inning off reliever Jeff Weaver to tie the Series 2-2. In Game 5, New York made a late inning comeback attempt that fell short as they lost the game 6-4. The teams would return to New York with the Marlins leading the Series 3-2. With their “backs to the wall” the Yanks sent LHP Andy Pettitte to the mound. Pettitte pitched well, keeping his team in the game, only giving up single runs in the 5th and 6th. But Josh Beckett pitch an even better game for the Marlins, throwing a complete-game shutout to win the World Series 4 games to 2. Beckett was named Series MVP. 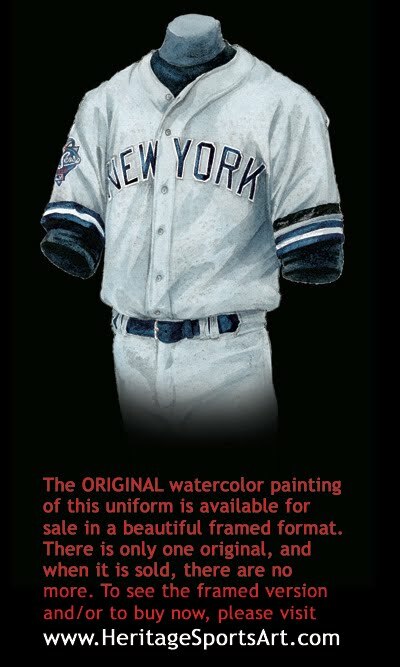 In 2003 the Yankees wore a patch celebrating their 100th Anniversary on the left sleeve of their home pinstriped uniform. Text not yet written but the Yankees opened their brand new Yankee Stadium this season and went on to finish with a 89-73 record, good for 3rd in the tough AL East. 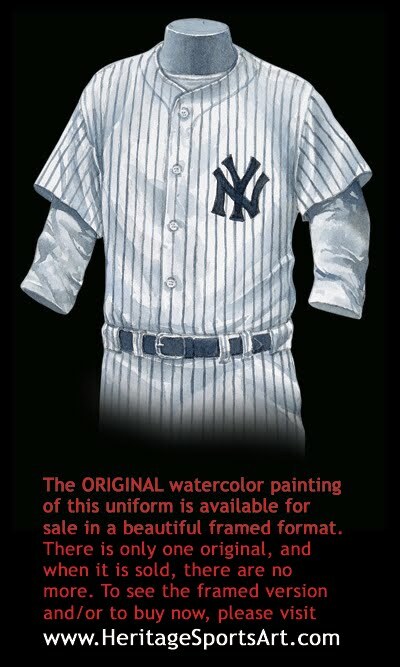 If you love the New York Yankees and the history of the Yankees franchise, you might really love to own an original piece of artwork celebrating the team's historic uniforms as seen in the poster at the top of this blog - you can actually own one of those original pieces of art! There are only 17 pieces of original art available for sale, and when these 17 are sold, that's it, they're all sold out. If you would like more information about this great artwork including the three ways you could purchase each piece, please visit our New York Yankees YouTube video at www.youtube.com/watch?v=St8TW_5C5VE or go directly to the artwork website www.heritagesportsart.com/New-York-Yankees-c151/ where you can see and purchase the artwork. 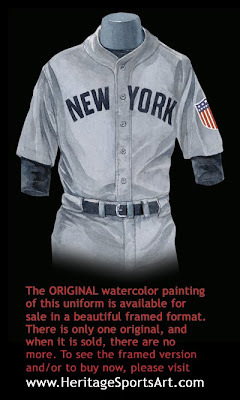 And please search my blog archive http://heritagejerseys.blogspot.com/ for other blogs on the history of the Yankees.